Welcome to the latest edition of the Marketing Leverage Times. Our goal is to provide you with provocative information and thought-provoking commentary on marketing and business issues. We hope you’ll enjoy this regular collection of tips, tidbits and tools and we welcome your input and feedback. One of the side effects of our interconnected, always-on world, is that we seem to have created a new set of experts. Every time you turn around, you’ll see someone pontificating on a topic as if they have studied it in great depth for years. Except that, in most cases, they haven’t. How Do You Get Heard Above the Noise? Having trouble being heard in a crowded marketplace? Wondering what successful organizations do to stand out above the noise? 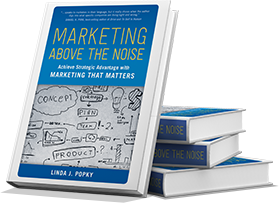 Linda’s new book, Marketing Above the Noise: Leveraging 8 Timeless Truths for Strategic Advantage, addresses these questions. The book, to be published by Bibliomotion Press, is currently in production and will be available in early 2015 in hardcopy, eBook and audio book versions. Look for more information coming soon. 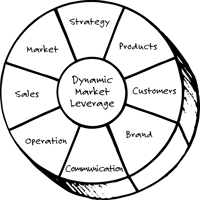 Our new Dynamic Market Leverage Assessment is designed to assess how marketing organizations are performing on 8 key market leverage factors, and 5 momentum factors that can impact the success of strategic marketing initiatives. This information can help pinpoint the critical areas where an organization can focus to best leverage their strategic marketing resources as effectively as possible. The assessment takes about 15 minutes to complete. You’ll receive an overview assessment and be eligible for a no obligation review of the results. Top of Mind Thursday is a Hit! These are typical of the comments we’re receiving about our new weekly communication, Top of Mind Thursday. Look for this each Thursday morning. If you’re not getting this, subscribe now. Or, tell us who else should be receiving this, too. Need help with that writing project? 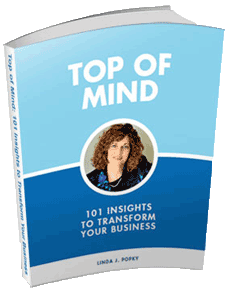 Linda Popky has written and edited commercially published books, as well as book proposals, white papers, news releases and other collateral pieces. We can help you create a strong, impactful proposal, product effective marketing collateral, or develop and craft a full book proposal. For more information, contact Linda. Wouldn’t it be nice to have a third party objective resource? How about a sounding board for reviewing plans, an idea source for planning implementation, a responsive expert for questions and advice, a support system for accountability, or just a devil’s advocate to review potential key decisions. In less than 90 seconds, we’ll give you a useful marketing tip or insight. New videos will be posted regularly. Watch the latest episode now. Check out the latest episodes in our podcast series, Marketing Thought Leadership. Join our podcast update list. Suggestions for speakers or topics? Let us know. Linda’s presentations this spring included Marketing for Consultants at Alan Weiss’s Million Dollar Consulting College® in Newport, RI and on Marketing Eye for the Non-Marketing Guy (And Gal) at the Alan Weiss Mentoring Summit in Los Angeles. She also presented to the Professional and Technical Consulting Association (PATCA) on Leverage: How to Grow Your Consulting Practice With Less Marketing and to Women in Consulting about Stand Out! Become a Thought Leader. Linda is now the Public Relations Coordinator for the Society for the Advancement of Consulting (SAC). Linda interviewed diversity expert Simma Lieberman about ways to impact the climate of inclusion in your organization, based on Simma’s new eBook, 110 Ways to Champion Diversity and Build Inclusion. Linda joined 40 other Silicon Valley Women of Influence this spring who participated in the special Bizwomen Mentoring Monday event in Palo Alto. For the 5th consecutive year, Linda was asked to judge the New Mexico Press Women Annual Communication contest. She was also a judge for the Business Marketing Association’s B2 Awards. We are in the process of booking our Fall and Winter speaking schedule. If your business or association could use a dynamic, thought-provoking presentation or workshop on marketing or business strategy, please contact us at info@Leverage2Market.com. Our goal is to offer the value we provide to as many people and organizations as we can. Our business is 100% referral-based, which means we rely on people like you to tell others about the types of results they can get from working with us. If you know an organization that could benefit from more impactful marketing programs, processes, or people, please let us know. You are receiving this newsletter because you have been identified as someone who may be interested in receiving communications related to marketing strategy from Linda Popky and/or Leverage2Market Associates. We do not ever sell, rent, lease, or otherwise distribute our mailing list. If you would like to be removed from this list, please unsubscribe here. For more information on how to get more powerful performance from your marketing investment, contact us.